WASHINGTON — President Trump’s top trade negotiator raised doubts on Tuesday that a trade agreement with China was within reach, saying that “major issues” must still be resolved and that it was impossible at this point to predict success. His comments contrasted sharply with Mr. Trump’s more optimistic take last month, when he said that “significant progress” had been made in resolving the yearlong trade war with China and that he would not raise tariffs on Chinese goods. Mr. Trump predicted that he would soon meet with President Xi Jinping of China for a signing ceremony at Mar-a-Lago, the president’s Florida resort. But administration officials have since become less sanguine about the potential for a quick deal, and Mr. Trump has indicated that he is prepared to “walk” from a deal if it is not in the United States’ interest. On Monday, a White House spokeswoman said no date had been set for a signing ceremony. On Tuesday, Mr. Lighthizer would not commit to a timetable for wrapping up the talks. China has been wary about committing to a meeting between Mr. Xi and Mr. Trump before a firm agreement is in place. While the United States and China have made progress on the talks, Beijing continues to resist demands by the Trump administration that the Chinese believe could undermine national sovereignty or economic development. Republicans and Democrats on the Finance Committee pressed Mr. Lighthizer for details about how or whether the White House would end a tariff war that has taken a toll on financial markets and the United States’ agricultural sector. Mr. Lighthizer said the two countries were still trying to work out how an agreement would be enforced and how far the United States would go in rolling back Mr. Trump’s tariffs on $250 billion of Chinese imports. Democrats have been pressuring the Trump administration to be more hawkish on China and not to settle for a quick deal to end the trade dispute. Senator Ron Wyden of Oregon, the top Democrat on the committee, tried unsuccessfully to get Mr. Lighthizer to commit to keeping tariffs in place until China had demonstrated that it could keep its promises. Mr. Lighthizer refused to reveal whether the United States was pushing for such a policy, or whether it would lift its tariffs altogether once the deal was struck. The United States wants China to commit to lowering trade barriers, ending the forced transfer of intellectual property in deals with American companies and scaling back subsidies of state-owned enterprises. It also wants China to promise to end competitive devaluation of its currency and be more transparent on foreign exchange matters. While Mr. Trump and other top economic advisers like Steven Mnuchin, the Treasury secretary, and Larry Kudlow, the director of the National Economic Council, have expressed optimism that a deal is close, Mr. Lighthizer has been far more cautious in his assessment of the negotiations. Last month, Mr. Mnuchin said in the Oval Office that an agreement was reached on currency, but Mr. Lighthizer said that while there had been progress on that front, nothing had been finalized. “Nothing is ever done until everything is done,” he said. Mr. Lighthizer told lawmakers on Tuesday that China was pushing hard for all American tariffs to be removed, but that no decision had been made yet. The United States wants to maintain the right to impose tariffs if China is not living up to its commitments, raising the prospect that Mr. Trump could again levy taxes on Chinese goods if he grows unhappy with China’s behavior. Figuring out how to enforce the trade agreement continues to be one of the biggest obstacles. 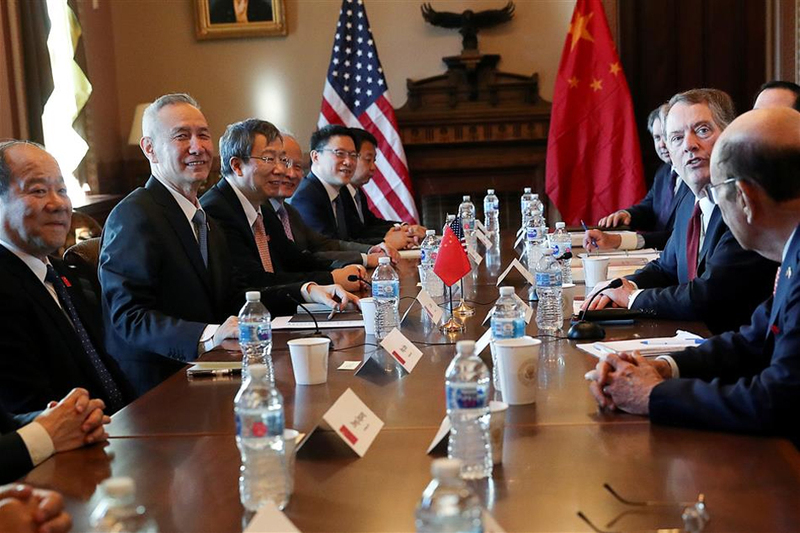 Mr. Lighthizer on Tuesday outlined a situation in which American and Chinese officials would meet throughout the year and raise concerns of companies in their respective countries. The Trump administration had been pushing an approach that would force China to abdicate its ability to retaliate against new American tariffs. However, Mr. Lighthizer suggested that either country could impose tariffs if obligations created by the agreement were not being met. Trump administration officials have said little about what China could get out of a deal with the United States, but Mr. Lighthizer noted that they were looking for the removal of tariffs, which have begun to hurt the Chinese economy, and some improved access to the United States’ markets. Mr. Lighthizer also offered a fairly downbeat assessment of the administration’s other trade fights, including talks to remove metals tariffs on Canada and Mexico and efforts to strike a trade pact with the European Union. Mr. Lighthizer said he had been trying to come up with a “sweet spot” that would most likely entail quotas, rather than tariffs, on steel and aluminum imports from Canada and Mexico but that would continue protecting the United States’ domestic metal industries. Canada has said that it does not believe that any trade barriers on metals are warranted. Negotiations with the European Union on a new free-trade agreement could also be derailed by a dispute over whether agricultural products will be included in the pact. The United States is demanding that farmers have more access to European markets, but the European Union has insisted that is not on the table. He also acknowledged that American farmers were losing market share in Japan, as countries that remained in the Trans-Pacific Partnership begin benefiting from lower tariffs on exports to Japan. Mr. Trump pulled out of the partnership within days of taking office, and Mr. Lighthizer said that working out a trade deal with Japan remains a high priority. But for now, Mr. Lighthizer is keeping most of his attention on China. He said that he and Mr. Mnuchin had spoken to their Chinese counterparts on Monday night by telephone and that he planned to do so again on Wednesday. “We are working more or less continuously,” he said.